If you are like me, phrases like “quantitative easing”, “monetizing the debt” and “inflationary policies” make my eyes glass over. I don’t have a degree in economics. I want to trust smarter, or at least more economically educated, people than I to handle those policies and strategies. But one thing I have learned over the last few years is that we common folk have to be at least marginally aware of what is going on in Washington and with our economic policies, because they can and do affect us. I am not going to try to explain what the Fed’s announcement yesterday that they will print $600 billion dollars (and $200 bil. more later) to buy our debt from ourselves means to you. I will let the bigger brains at CNBC do that here. I am concerned though that adding all this Monopoly money to our money supply will inevitably lead to inflation. In fact, it already has. This is the second time the Fed has done “quantitative easing”, which as far as I can tell is a fancy word for pumping money into the economy. So I’m not a revered economist like John Maynard Keynes, but it seems to me that when you print more money, the money we have is worth less. They call that “inflation”. It’s like a hidden tax, because we pay more for basics like milk and tires and all the things that are not manufactured in the US or whose components aren’t manufactured in the US (re: almost everything). Our dollar is devalued. It is worth less than before. This is being done on purpose right now in an attempt to jump-start the economy. Do most Americans understand that is happening? They will notice soon. I don’t know if the strategy will work. Like I said, there are smart people making these decisions. But as the CNBC article says it is a big gamble. We will immediately begin paying more, or, as George Soros called it, experience “a managed decline of the dollar”. He should know because “Soros has often drawn criticism for speculating heavily on the collapse of fragile currencies”. I know this is tedious to study and to try to understand. I am only getting started and I don’t want to do it either. However, this stuff matters. We have to try to get educated and pay attention because no one is infallible and the checks and balances of our democratic republic include the American people. 5. If they are wrong… You almost don’t want to know. Trust me. It’s bad. China and Japan stop buying our debt, our dollar crashes… It has happened before to other countries. So we know what to expect and it’s a world of hurt. The good news: if we can crank this economy up and get American business growing again, we can make it through this. I don’t know if I believe in the omniscience of the Fed, but I do believe in the power of the American people and American free enterprise. If your eyes have not glassed over yet, take a look at the following talking heads on CNBC. It is hard to get through, but if you do, you will learn some things that I think are worth paying attention to (IMF acting as a global central bank?!). As always, I welcome discussion. In this particular case I am praying that someone shows me where I am getting it wrong. This entry was posted in Uncategorized and tagged devalue, dollar, Fed, Federal, inflation, M2, Money, QE2, Reserve, stimulus, Supply. Bookmark the permalink. The sad thing is that Fed Chairman Ben Bernanke said we will NOT monetize our debt. Now the Fed is monetizing the debt. Ben Bernanke lied and his mentor Milton Friedman would be not be proud of him. He does not have the backbone to push back on the political bureaucracy. Well, I think you’re conflating two things, inflation and a decrease in buying power. 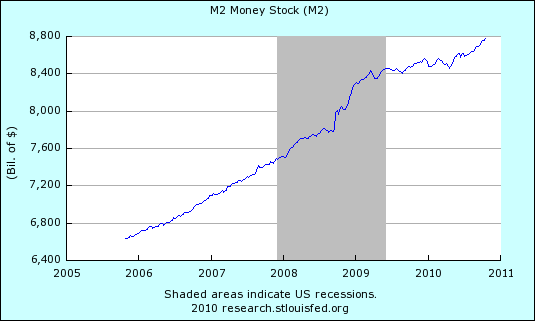 Inflation is simply an increase in the money supply. Buying power goes down when the same amount of money buys fewer goods than before. It’s possible to have both inflation and stability in buying power: The Fed can create more money, which gets socked away, unused (because of fear, for example). In this case, though money was created, there’s not actually any extra money in circulation, and buying power is stable. Because of the recession, many economists have been concerned about an _increase_ in buying power, as reflected in a general decline in prices. When this happens, there’s an effect where people will actually start delaying their buying in hopes that prices fall even further and they can get an even better deal. Imagine the case where you’re at a half tank of gasoline and prices are at a historic high (remember when they were over $4.20/gallon?). If you see prices go down a nickel, with lots of news coverage of future drops, you might hold off on filling up, even if you usually fill up when you’re at a half gallon. And if you see prices drop 8 cents a day, you might see how long you can drive so you can get the lowest price possible. John, so the Federal Reserve asked the U.S. Treasury to print 600 BILLION just for the heck of it? The reality is that the U.S. is out of options and the Chinese will no longer buy our “Junk” bonds. Oh yeah, and I’ll bet it makes the Chinese feel all warm and fuzzy to know that the value of their investment will be less. There are four ways the Gov’t pays for its bills. 1) Taxes it citizens 2)Borrows the money (bonds) 3) Cut Spending 4) Inflate (print more money)Whether or not the actual 600 BILLION circulates now or later, we are buying our own debt! Something that Bernanke outright lied! Have not learned from history? That is EXACTLY what happened to Germans after World World 1. They kept printing more and more and more money until they went into hyperinflation. The buying power of stability is an illusion, especially in California. I guarantee you we will pay more for commodities in the coming months. Ask yourself a simple question. Could you buy more with the dollar 10 years, 5 years ago? I don’t know what economists you have been reading that they are concern about an increase in the buying power of the dollar. I disagree. Our nation is an instant gratification society that wants things NOW not later. People are not delaying “in hopes that prices fall even further and they can get an even better deal.” as you state but rather people are delaying because there are no jobs! _IF_ deflation is happening (I seriously doubt) its not because of bargain shopping but because there are no jobs. The best way to fight deflation (if it is indeed happening) is to allow the Free Market system to do what it does best. The Federal gov’t can learn a few things from these states gov’t. John, I don’t understand that video. Even if we did experience some deflation due to market pressures, if there is demand for products then there is only so much cutting back that a company can do. I saw this with the company that I work for. We laid off 600 people in early 2008. All us remaining employees had to do more with less. But when demand picked up again, my company started hiring again, because efficiency will only get you so far. But what concerns me more, if the fact that commodity prices are on the rise. They show the first signs of inflation. Oil was at a 2 year high today. Gold is at record highs too. That means that the dollar is week and raw materials and commondities are costing us more. If the price of steel and wheat goes up, eventually the price of buildings and bread goes up. In high school, inflation was explained to me like this . . .
Say you have one pie (pick your favorite kind) and there are eight coupons available to get a piece of that pie. Awesome, so when one of the eight coupons is used, it is exchanged for a decent amout of yummy pie. Now let’s use fifty coupons instead of eight. You get a significantly lesser amount of pie in exchange. The more coupons available directly effects how much pie is available per coupon. You can keep rasing the amount of coupons until there is virtually no pie to be exchanged for the coupon. So when you look at fifty coupons vs. eight coupons, the eight coupons are much more valuable in comparison. Every time the government decides to print more money (coupons) they are devaluing our currency. There is only so much gold (pie) behind the American dollar. Why don’t they just start selling money printing machines at local department stores so we can all take care of our own, personal debt? It is so like Monopoly money. I really can’t comprehend the government’s thought process. Let’s pray they are doing right and that this will help America. God has appointed our leaders and is in control of all things, good and bad. Nothing ever happens in this world without His letting it. Mallory, I love your comments about pie and coupons. But your last comment about God allowing everything sounds like you means He wills it. Two different things. Otherwise there would be no need to pray for different outcomes. And prayer does change things! God leaves us to our own decisions, good or bad. People who do not seek after Godly wisdom are likely to make bad ones for themselves and our country. I personally read this blog and wonder how long until we can TRUST the people we elect to govern in our best interest so we can get back to the much smaller picture of running our own lives. But for the time being, we cannot!! We must pay attention to ALL this stuff and continue to wake up our fellow Americans!! Listen to what the rest of the world (key players) are saying about monetizing our debt! This is what China, the underwriter for our debt, has to say about monetizing our debt. “As a major reserve currency issuer, for the United States to launch a second round of quantitative easing at this time, we feel that it did not recognize its responsibility to stabilize global markets and did not think about the impact of excessive liquidity on emerging markets,” Chinese Vice Finance Minister Zhu Guangyao said at a briefing on Monday. This is what the German’s have to say about the Fed’s latest move. “I don’t think that the Americans are going to solve their problems with this, and I believe that it is going to create extra problems for the world,” Wolfgang Schaeuble said on ARD public television late Thursday. And here is Brazil Chiming into the Fed’s actions. Now who thinks monetizing our debt of almost a trillion dollar is a good thing? Wake up people!!! We (America) are setting ourselves up to have the finger be pointed back to us! The key phrase is “if there is demand.” The fear with systemic increase in buying power is that demand _doesn’t_ pick back up as people wait and wait on their discretionary purchases. This effect can be seen in a few ways. 1) Waiting. Why buy a flat-screen TV now when my current one works and the sales keep getting bigger and bigger? 2) Substitution. Cooking in instead of eating out. Staycation instead of vacation. Knotts instead of Disney. Netflix instead of movie theaters. The rising price of gold has almost no effect on any non-luxury manufactured goods. I mean, exactly what is more expensive because gold is more expensive? Jewelry? Monster cables? The rising price of oil is way more troubling. Oil has a cascading effect on everything in our economy, as our entire supply chain is built on oil use. Definitely a potential loss in buying power there. You’re making a good point. Demand for some goods have fallen during recent times because people have lost jobs, are living within their means instead of above their means, or are living below their means, saving money instead of spending it. I see more brown bags at work recently as opposed to fast food bags, for example. All of that stuff leads to lower demand and falling prices. As the video points out, that can have a network effect on the economy as falling demand puts people out of business which leads to job loss which leads to falling demand. But at the same time, you seem to be arguing that prices aren’t falling, which is odd. I can buy more computer than ever before. More TV than ever before. More house than 5 years ago. Local restaurants are flooding me with coupons. No one is trying to sell a $400 smart phone. Weekly Borders ads are 33 or 40% discounts and never below 25%. We’re not an instant gratification society when people are out of job or have less money and the easy credit spigot is welded closed. Your “bowing to political pressure” statement is really odd. Bernake’s term runs out in … 6 years? He has the pressure of being right when judged by economists in the future, not political pressure. Hmmm. I don’t think that NPR article made me feel any better. Allthough their “translation” was funny (and helpful to unravel the jargon). But the bottom line is there isn’t much good that will come out of worrying about this risky strategy. I just keep seeing stories on the news about another economist or country saying “no, no, Fed, bad idea!”. Still, I guess it is good to be prepared in case the policy does too much harm to the dollar or worse, but that’s why they say “prepare for the worst and hope for the best”. So I won’t lose sleep over it, but I guess it is good to pay attention to what is going on. Maybe the Fed will be right and at the end of this “experiment” I will simply realize that they understand more than I do and I should just stop worrying about it and trust the Govt and the Fed. I hope. I think that prices are down on many things because of the bad economy. People do more with less. I know that I am spending a lot less money than I used to. Consumer credit debt is down while govt debt is up. Part of it is that we all got too spend-happy in the “see-want-buy now-pay later” mentality of the last decade. I know I did and now I am stuck with high interest debt on my earlier decadence. (who needs 3 ipods? )I just worry that with commodity prices going up (like oil and food and other imports) and if the dollar loses value in relation to other currancies because of the intentional inflation caused by QE2 that we might be in for more inflation than the couple percentage points that the Fed is hoping for. But like I said above, only time will tell if those fears are founded. Even though I learned my lesson on over-spending the hard way, as did many Americans, at least we learned the lesson and I hope we don’t forget it. I’m not arguing that prices are not falling. I’m arguing against you introducing the idea that we are experiencing deflation. During economic downturns, of course people are going to cut back in their spending and people will buy less thus decreasing the prices consumer products. However, I would hardly call it a deflation but rather an economic (market) correction. The examples you are giving me are technological in nature. Technology products always start with high prices and then work themselves to lower prices due to design improvements, manufacturing, overhead and procurement costs. This happens regardless of the economic circumstances. Manufacturers just learn how to build better mouse traps as they become competitive. I know this firsthand because I work as a Manufacturing Engineer (when I do work that is). It is my job to reduce production cost. The other reason you might be able to buy more of a particular technological product is because companies currently have high inventory levels. During these times it’s better to sell them at wholesale cost or even at a loss of production cost. Companies need to pay their bills and some money is better than no money. During economic downturns, manufacturing companies have typically high inventories and very little demand for products. So the first thing they do is reduce the size of the workforce by laying off people (voluntary and involuntary). Secondly, reducing the size of inventory levels is the next priority. This is often the hardest thing to do because no matter how good of deal a company offers a product, if consumers don’t have money (no demand), OH WELL! I know this first hand because I remember back in 2000 when the dot. Com bubble busted, the company I worked for at that time could NOT give away the products for free! We scrapped over 30 MILLION dollars in finish goods inventory!!! As far as buying more house than 5 years ago, you need to look at housing in a 10 year cycle not a 5 year cycle. Real Estate roughly does a full cycle once every 10 years with a positive incline. Here is an example. A home in Costa Mesa, CA worth around $250k in 2000 increased to $750k by summer of 2006 and is now selling for $500k in 2010. After market correction due to economic forces, the price of the home has doubled in the last ten year. Yet salaries in California have not doubled at all! If anything they have gone down! You cannot buy MORE house now compared to 10 years ago. As far Bernanke is concerned, he is being judge by national and global economist now and they are NOT approving of his monetizing our debt. Monetizing up to almost 1 TRILLION dollars is crazy! Read my post above about China, Germany and Brazil have to say monetizing debt. The Feds think that monetizing our debt will give our ailing economy the boost it needs. I really hope and pray I am wrong. I really do. But I don’t think it’s going to work. As I said before, the buying power of stability is an illusion, especially in California. We are spending more money in homes, gasoline and basic food commodities compare to 10 years ago and salaries have NOT kept up. And I’m not arguing that we’re experiencing deflation. I’m saying prices are falling, and not just on technology products. Restaurants and books, were on the list, for example.